Thank you for your generous, ongoing support of Stay-Focused, and our programs for teens with disabilities. Some people are going to be very happy thanks to you and all the good people at the Claddagh Foundation. Thank you for supporting Adaptive Adventures with grant funding. The Claddagh Foundation support will allow Adaptive Adventures to fulfill its mission to provide progressive outdoor sports opportunities to improve quality of life for children, adults, and veterans with physical disabilities and their families. The award will support the purchasing of equipment and scholarships for individuals with physical disabilities within the Midwest region. ...it will be with great pleasure that we pass along funds to families trying to cope with the many costs related to physical disabilities. Thank you for your contribution to The Circle of Friends - providing socialization opportunities for mentally disabled students who are matched in a one on one relationship with a peer buddy. 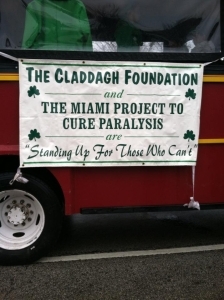 We very much appreciate the ongoing support from The Claddagh Foundation. On behalf of the University of Miami Leonard M. Miller School of Medicine, we thanks you for making a difference in what we are able to achieve. Your support is integral to our success, and we are deeply grateful to you for sharing our vision of a healthier future. Thank you for your incredible support and donation... I'm proud to tell you we received FDA approval to begin a Human Clinical Trial evaluating the safety of Schwann cells in people with spinal cord injuries in both the acute and chronic settings!... This is the only FDA approved trial using this type of cellular therapy on people with spinal cord injuries in the entire world... This approval offers real hope and shows we are closer than ever to curing spinal paralysis... I would like to offer my sincere gratitude on behalf of The Buoniconti Fund to Cure Paralysis for your most generous gift.